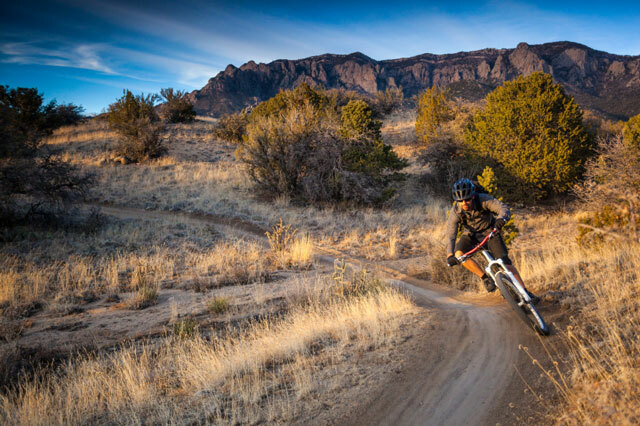 There’s lots to love about mountain biking in what locals call “the West’s most Western town.” Scottsdale sits at the northern edge of Arizona’s Sonoran Desert, where the cacti grow tall and the sunsets are indelibly vivid. Needless to say, the Sonoran panorama is a mountain biker’s dreamscape, and the city of Scottsdale is a great place to cool down and catch your breath after a tough day out on the trail. Here’s a peek at what mountain biking in Scottsdale is all about. We’ll share our favorite trails to ride and how best to prepare for a long, rigorous outing in the hot, dry desert. Most local mountain biking enthusiasts agree: the McDowell Sonoran Preserve is Scottsdale’s best place to ride. With over 60 miles of trails to brave, the Preserve touts routes for all riders, no matter how experienced they are. Confident in your skills? Try the Tom Thumb Trail, which offers steep climbs and hairpin switchbacks that are sure to get your heart pumping. The Gateway and Windgate trails offer serious climbs, too, and you’ll even face a little exposure (steep, sudden drops) to keep excitement levels at their max. If you’re up for it, there’s also a 1600-foot climb that takes you across Windgate and Bell passes. Just be sure to pack plenty of stamina! Beginners should start at the Brown’s Ranch Trailhead and try the Brown’s Mountain, Cholla Mountain, and Granite Mountain loops. The ascents are moderate, and the trails are more predictable (no hairpin stuff) than the ones catering to experienced riders. Basic bike safety tips aside (wear those helmets! ), riding in the Scottsdale area warrants special attention due to the local climate. The average high from July through September is 103 degrees – Scottsdale is hot! How should you prepare for the heat? For starters, you can ride during the mornings and evenings to avoid the highest temperatures. Deliberately planning ride times is probably the best way to avoid the dangerous consequences of riding in temperatures above 90 degrees. And always ride with a friend or with someone who knows the route. If it’s your first time at the Preserve, you don’t want to risk getting lost and spending more time in the heat than you anticipated. Another good rule of thumb is to pack more water than you think you will need. If you don’t have two or three bottle cages on your bike frame, now is the time to mount them. The risk of heat exhaustion is real, especially during the sweltering summer months. In addition to carrying water, be sure to consume 17 to 20 ounces of water before leaving for your ride. Also keep in mind that shade will be limited, so you should apply sunscreen and sun-protecting lip balm prior stepping into the heat. Take a small bottle along with you so you can reapply every couple of hours. One more tip: Before leaving for your ride, take down contact information for the Scottsdale FastMed Urgent Care facility. Add us to your phone or take along a note that includes our number! We’re here to help should you experience illness or injury out on the trail.